Much ado about naething, I argue in Slate. The Times reported last week that President Obama plans to negotiate a non-legal climate agreement with other major emitters so as to avoid a Senate vote that would otherwise be required for a “treaty.” The treaty obligations are somehow both “voluntary” (for the benefit of the Senate audience) and “legally binding” (for the benefit of Obama’s constituents). Times reporters now routinely state that the president is “circumventing Congress” whenever he does something on his own, whether or not the Constitution, precedent, or statutes gives him the authority to do so. So I wrote this Slate piece to explain that President Obama’s approach was not unconstitutional, or even particularly notable. Presidents can make agreements with foreign countries and then engage in parallel play with foreign leaders–conforming to the agreements to the extent they have independent authority to do so. They have done so for decades if not centuries. I expected that this latest development would be additional grist for the mill of Obama critics who think that he is a “domestic Caesar,” but the outrage seems to have been lost amid the general disintegration of international order. My new book can be pre-ordered from Amazon. 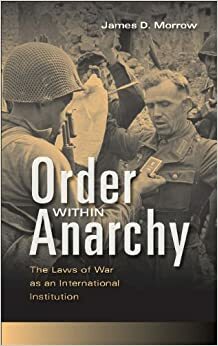 This book explores compliance with the laws of war, focusing on laws regulating the treatment of POWs, using theoretical models and empirical data. Governments take an instrumental approach to the law: they follow it when it serves their interest. The major way this can happen is if retaliation by the enemy is worse than any temporary gains from violating the law while the enemy follows it. Thus, a state may violate the law if (1) the law puts it at disadvantage and so it gains from disregarding it even if the enemy does as well; or (2) the law puts the enemy at a disadvantage so it cannot be expected to comply with it. Mutually beneficial cooperation can break down because the rules are unclear, but trying to get them precise in advance is difficult because of uncertainties about future changes in technology and the like. A good companion book is Isabel Hull’s A Scrap of Paper, which examines the laws of war during World War I. Hull also addresses the laws of neutrality, which create more complex strategic interactions than POW rules do. A belligerent wants to inflict as much harm on the enemy as possible, including interference with trade with neutrals, but up to the point where the neutrals themselves protest and may join forces with the enemy. The legal rules play an even more limited role than POW rules do. Neutrals have complex attitudes toward the belligerents, and some will tolerate violations of the law of neutrality by one belligerent because of their hostility to the other. Hull is a historian while Morrow is a political scientist but the books tell a similar tale about governments’ instrumental attitudes toward international law. International law professors, who regard international law from a static, doctrinal perspective, and against all evidence take compliance for granted rather than as a problem that influences how the law is interpreted, could learn a lot from these books. Would it be lawful for Israel to shut off electricity to Gaza? Yes, says Avi Bell (updated version here). No, says twelve other scholars in Israel. This is a purely hypothetical question because Israel has expressed no intention of shutting down the flow of electricity into Gaza, and probably wouldn’t gain anything by doing so. But since you asked…. International law does not bar a belligerent from cutting off electricity. Indeed, a belligerent is free to bomb the power plants of its enemy, as the United States has recently done in Iraq and Serbia. Gaza has only a few power plants and receives most of its electricity from Israel. Israel could cut off electricity even if it were not at war with Gaza, just as it could refuse to trade with Gaza. Being at war with Gaza, it could not only shut off electricity, it could blow up Gaza’s plants. A possible counterargument would be that Israel occupies Gaza. An occupier normally must maintain services for the people living in occupied territory. So one question is whether Gaza is occupied. No: Gaza has its own government and own militia. Yes: Israel controls the borders and can intervene at will. I think the better answer is No–Gaza is blockaded and besieged but not occupied. But the 12 authors don’t argue that Israel occupies Gaza. Instead, they argue that Israel has certain obligations to Gaza because Israel used to occupy Gaza and since withdrawing has prevented Gaza from developing infrastructure by blockading it. There is an Israeli Supreme Court case that lends credence to this theory, but international law does not. There is no legal authority for the principle that a belligerent that has withdrawn from a country has any obligations toward it that arise from the former occupation. Nor can the authors cobble together a description of the contours of those obligations if they did exist, so even if Israel owed obligations toward Gaza of some sort, it would hardly follow that it cannot cut off electricity if it believed that doing so advanced a legitimate military objective. I suspect that Israel has sensible political reasons for not cutting off electricity, and so let us hope that this debate remains theoretical. This book describes the turmoil in the South China sea, where China, the Philippines, Malaysia, Singapore, Taiwan, and Vietnam all vie for control over marine and mineral resources. The book consists of thumbnail sketches of each country’s history, economy, political cultural, and position with respect to the South China Sea, and describes the conflicts that have so far taken place. Kaplan takes a relentlessly realist view, arguing that the source of conflict is China’s rise, and the only way to stop the conflict is to maintain a balance of power, which means that the United States must both accommodate China and resist it. Kaplan has little to say about international law. In a brief discussion of the Law of the Sea Treaty, he argues that if it weren’t for nationalism, the countries could divide up the resources peacefully. He draws a distinction between emotion and intellect–law fails because it can’t contend with emotion. But it’s an odd thing for a balance-of-powers theorist to say: the balance of powers also depends on states acting in their self-interest rather than succumbing to the fires of nationalism. The real problem with the Law of the Sea Treaty is that it does not divide up resources in a manner that reflects the power of countries in these region, and that is what has caused China to depart from the Treaty and insist on ad hoc negotiations with all the attendant risks. If governments lose control of the nationalism of their populations, all bets are off whether you are a realist or a legalist. The Supreme Court ducked the issue raised by this case–whether there are constitutional limits on the federal treaty power. I wrote about this case in Slate a while back. The question was whether a woman who tried to kill or harm her husband’s lover with some chemicals could be prosecuted under a federal statute that implemented the Chemical Weapons Convention. The majority doesn’t think that Congress intended the statute to reach ordinary criminal behavior–or won’t assume otherwise unless Congress is clear that it wants to disregard the normal division of police powers between federal government and states. Why not? Because if the treaty power is unlimited, then the United States and Latvia could enter a treaty that requires each country to block people from carrying guns near schools. This is not my example but Scalia’s (no joke; see p. 13). The United States and Latvia have not in fact negotiated such a treaty. Why not? Could it be that countries do not enter into treaties that regulate internal matters because they have no reason to do so? Scalia does not identify any real treaty that he thinks the U.S. government entered into in order to evade constitutional limits on its powers. Surely, he doesn’t think that the federal government entered into the Chemical Weapons Convention so that it could prosecute people who attack each other with household chemicals. The unstated target of the opinion is the international human rights treaty. Those treaties ban all kinds of police-powers-related stuff. The Senate ensured that they were not self-executing, but I suppose that the next time Democrats control the government, they could pass laws that implement them. At least in theory, a Democratic sweep could result in ratification of a human rights treaty that bans the death penalty, and then implementation of it through a federal statute. Not likely to happen anytime in the next few decades if ever, but you can’t fault Scalia for failing to think ahead. As the dust settles on the Ukraine crisis, we should ask how it might affect our understanding of international law. Various theories of compliance with international law must contend with the fact that Russia violated international law and got away with it. No one has ever argued that countries never violate international law. The argument is always that if they do, they incur a cost above and beyond the costs inherent in the activity that constitutes a violation. Violation of the law itself brings with it special harms to the violator. Is that the case with Russia? 1. Retaliation? The West imposed sanctions on Russia but by all accounts those sanctions were trivial. 2. Reputation? It is possible that Russia’s reputation has suffered. Will countries now be less willing to enter treaties with it? Unfortunately, it is impossible to tell. But Russia recently entered a Eurasian Economic Union. The other two members don’t seem bothered by Russia’s law violations. Nor does China. Or even Germany. 3. Utility losses? Many theories, if taken literally, suggest that Russian officials, perhaps Putin himself, must have overcome reluctance to violate norms that they have internalized because those norms are fair, or network or conformity effects or some such thing exist. Any evidence for this? No, but also hard to imagine how we would find any. It is simpler to recognize that international legal norms outstripped the interests of countries, and so there was no incentive to uphold them. Putin’s seizure of Crimea has weakened the Russian economy, led to China getting a bargain gas deal, revived NATO, spurred Europe to start ending its addiction to Russian gas and begun a debate across Europe about increasing defense spending. Nice work, Vladimir. That’s why I say the country Putin threatens most today is Russia. Except that Russia’s economy was not weakened–the stock market was trading in the 1400s before the crisis and is trading in the 1400s today. The ruble is roughly unchanged, a hair lower. No one really knows whether China got a bargain or not; too much depends on unknown contingencies. But it is clear that Russia has benefited from closer relations with China. NATO hardly seems revived, the European countries are in turmoil and divided in their response to Russia, and as dependent on its gas as ever. Defense spending is not likely to increase, but even if it did, Russia would hardly care since it has no plans to invade Poland or Germany, and knows that they have no plans to liberate Crimea or provide military aid to Ukraine. Against these trivial costs if that is what they are, consider Russia’s gains. It swallowed up Crimea in a flagrant violation of international law; it has ensured that the Ukraine government, whether nominally pro-Western or not, will give great weight to its interests; and, most important, it has sent a credible threat to all its neighbors that they will suffer if they do not give deference to Russia’s interests, while making clear to the world that the West is weak and divided. Meanwhile, the establishment of the new Eurasian Economic Union is a “diplomatic triumph” for Putin, according to The Economist. And Western countries will seek a return to normalcy in their relations with Russia as quickly as possible, hoping that no one will remember Crimea. Saying that Putin “blinked” is like saying that the boy who stole a cookie from a cookie jar blinked because he took only one cookie rather than all of them. On China v. Vietnam et al. A lot of puzzles here. China, the Philippines, and Vietnam are parties to the UN Convention on the Law of the Sea, which provides for arbitration in case of disputes under that treaty. The Philippines initiated an arbitration against China in 2013 over the Spratly Islands area. Vietnam now has signaled that it will join that arbitration. The overall goal seems to be to obtain an authoritative rebuke of China’s broad claims over the South China Sea. Yet despite the case’s practical insignificance, China has been frantically—and unsuccessfully—trying to stop it from proceeding. In January 2014, Beijing reached new levels of desperation, and allegedly offered to withdraw its ships from Scarborough Shoal if the Philippines would delay filing its memorial in the case. While that proposal should be viewed with suspicion—after all, Beijing has reneged on deals relating to the shoal before—it is nevertheless an extraordinary offer if true: China was willing to give up control of territory over which it claims sovereignty just to avoid a bit of bad publicity. So while China won the battle for Scarborough Shoal, it may have lost the war, all because Manila was able to find something that Beijing valued even more than the territory: its reputation for complying with international law. To China, its reputation is intimately connected to its long-term growth strategy, and the country cannot afford to advertise its total non-compliance with international law. We will see. What is odd is that China was free to opt out of compulsory jurisdiction under the UNCLOS. Unlike many other countries, it didn’t opt out when it ratified the treaty. Could it now? I assume so. Update–It was pointed out to me that UNCLOS parties can opt out of compulsory jurisdiction only with respect to some disputes, and not disputes over EEZ boundaries, sovereignty over islands, and the other matters that are at stake in the South China Sea. China did opt out of the compulsory jurisdiction for the unrelated matters in 2006. So if it loses the arbitration, it can only disregard the judgment. It could also withdraw from UNCLOS. The New York Times published an article a few days ago describing the eviction of Philippine fishermen from the waters around Scarborough Shoal by the Chinese coastguard. This is yet another territorial conflict between China and its neighbors. China and the Philippines also dispute the nearby Spratly Islands. The dispute over the Scarborough Shoal is a bit murkier than the others. Both China and the Philippines claim that they have exercised sovereignty over the area in various ways, going back decades. The Philippines seems to me to have the better argument but I have not looked at the materials closely. Otherwise, the fishing waters clearly fall within the Philippines Exclusive Economic Zone, as they lie within 200 nautical miles of the mainland (or technically the relevant baselines). Here is an academic article that, however, focuses on the Spratly Islands. One question that arises is why China and its neighbors are suddenly having so many conflicts that are violent or near-violent. The conflicting territorial claims have existed for decades but violence has been sporadic until recently (aside from the China-Vietnam War). M. Taylor Fravel argues that China seeks to “consolidate” its claims by keeping other countries out of disputed areas. That would explain why China reacts aggressively–by sending in ships and planes–typically after the neighbors pass some law or take other actions that make clear that they consider their claims valid. But why are those countries provoking China in this way, and why now? As Fravel suggests, China’s strategy is one of delay while claiming that the disputes are unresolved. The neighbors, by contrast, claim that there is no dispute and their claims are valid. China’s strategy thus seems more passive. And the reason is surely that time is on China’s side. China has grown more rapidly than all of its neighbors and looks likely to continue to do so for the near future, at least. As it becomes more dominant–both economically and militarily–its neighbors will be in a worse position to counter its claims in their shared waters. Thus, it’s in the interest of those neighbors to settle the disputes sooner rather than later–so that they can establish populations and structures on, and acknowledged legal title, to these islands; plus to the minerals and fisheries. China will have difficulty dislodging claims backed by possession and variants of it even when it is considerably more powerful. The question of timing remains hard to answer, but it may be that only recently has it become obvious to the neighbors that China’s economic and military dominance will in the coming years allow it to prevail in any of its legal disputes, and so it is best to get those disputes settled sooner rather than later even at the risk of provoking military conflict. Map and photo from The Telegraph. Earlier this month, China sent an oil rig to waters off the Paracel Islands in the South China Sea (upper left box on the map). 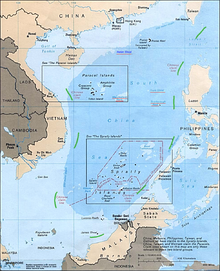 Vietnam sent ships to intercept the oil rig, but they were repelled by Chinese naval vessels. In Vietnam, outraged citizens rioted, destroyed Chinese property, and killed some Chinese nationals. China has threatened unspecified sanctions against Vietnam, apparently moving troops to the border, while Vietnam has moved to bring the riots under control. The Paracel Islands are within Vietnam’s 200 nautical mile Exclusive Economic Zone and on its continental shelf, so minerals in the area belong to Vietnam under the UN Convention on the Law of the Sea, which both Vietnam and China have ratified. What is the basis of China’s claims? In fact, China has never provided an official legal justification for its claims. Two scholars, Florian Dupuy and Pierre-Marie Dupuy (gated), who scoured Chinese sources have suggested the Chinese claims are based on “history”: that China has always controlled the South China Sea, or the islands that dot it. But, as they explained, this type of argument is not recognized under UNCLOS or traditional principles of public international law. China has not backed down but instead seems to be considering economic sanctions against Vietnam, which is highly dependent on Chinese trade, much more than China is on Vietnam. See this graph. A terrible decade for the Executive Branch in foreign relations cases before the Supreme Court? That’s the conclusion of Ingrid Wuerth, writing at Lawfare. And she singles out Chief Justice Roberts as one of the main skeptics of an argument that I made with Cass Sunstein in 2007. We argued that courts should defer to the executive branch on issues touching on foreign relations, just as they do under Chevron and related doctrines in (domestic) administrative law cases. Our argument was normative, based on the executive’s responsibilities and expertise, but we argued that it was consistent with the cases (a widespread view at the time). Wuerth notes that over the last decade the Court has discounted the executive’s views in numerous cases, including Kiobel, Morrison, Medellin, BG Group, and Zivitofsky, plus some early war-on-terror habeas cases. All of this raises some interesting questions. One is whether the Court has in fact cut back on executive power or just hasn’t advanced it as much as the executive would like. A rule that the executive always wins is not the same as a rule of broad but not unlimited deference. 1. The executive has lost prestige, thanks to its excesses against Al Qaeda, its failures in Afghanistan and Iraq, and perhaps even a perception that it has gone too far domestically. 2. The Court has gained confidence despite declining popularity, maybe because some aggressive decisions have not spurred pack-the-court style backlashes or because the executive and legislative branches are too divided to counter the Court. 3. The anti-executive tendency is the result of temporary partisan alignments. The Court was somewhat more liberal during the Bush administration and so perhaps uneasy with some of his policies; now right-wing justices are looking for ways to undermine Obama. 4. The justices share the public’s view that the U.S. should withdraw from many of its foreign commitments and turn inward. Weakening the executive is a step in that direction. 5. Originalism/formalism/textualism is in the air, and ( as scholars have long agreed) the modern system of executive power does not draw much support from the text of the Constitution or founding-era understandings. That’s the colorful term in Europe for the right to eliminate unwanted information about yourself on the Web. The European Court of Justice enforced that right Tuesday, holding that a Spanish data privacy authority acted properly to compel Google to remove from its search results links to old articles about a Spanish lawyer’s debt problems. Jonathan Zittrian criticizes the ECJ’s ruling as being both “too broad” and “curiously narrow” because it could censor the republication of public records and because it does not force the newspaper that Google linked to do take down its own pages. But that’s because the ECJ endorsed a balancing test–your privacy interest versus the public’s interest. It sensibly recognized that people get their information about others by using search engines, not usually by looking back through newspaper websites. Search engines are a greater threat to one’s privacy, while newspapers shouldn’t be forced to respond to complaints about reports when they are just doing their job. My argument can be found on Slate. McCain said Obama shouldn’t worry about whether the Nigerian government would approve or disapprove of a U.S. military intervention into the country’s affairs. The president didn’t seek approval from Pakistan before he sent U.S. troops into that country to get Osama bin Laden. And Obama shouldn’t worry about what the Senate and the House of Representatives would say if he exercised his authority as commander-in-chief and sent American troops into Nigeria. I doubt that this Putin defender did Putin any favors by comparing him to the “good” pre-1939 Hitler. The analogy here is that Putin is merely unifying Russian lands and not invading foreign countries for predatory reasons, which makes him a great statesman rather than, um, a Nazi. I have said before that I think that Putin is punishing Ukraine for turning west and in this way issuing a warning to other neighbors. This is realpolitik without ideology. The “good Hitler” view is that Putin is an ideologically committed nationalist who seeks to create a greater Russia. The views are not the same. The nationalist will want to purge Russia’s minorities as well, or at least give them second-class status (or I suppose third-class status to the extent their status is already second-class); and will want to annex Russian-dominated territories of even friendly countries. The pre-1939 Hitler was not good, of course; the Nuremberg laws and Kristallnacht were in the past, and invasion of Eastern Europe and enslavement of Slavs were always part of the plan. He created a dictatorship, slaughtered his political opponents, and bullied his neighbors. Hitler’s militant style of nationalism couldn’t stop at the borders of German-speaking lands. Maybe Russian nationalists too will want to settle Russians in other areas. Whatever his intentions, Putin has unleashed this virulent, self-destructive style of nationalism. Let’s hope he can (and wants to) put it back in the bottle. Proxy wars are a common cause of ethnic conflict. Serbia stoked foment in Bosnia and Croatia, as part of a vision for an enlarged Serbia-dominated territory. Russia is intervening by proxy in Ukraine, through support for the militia of a so-called People’s Republic of Donetsk. … The suffering caused by proxy state aggravation of ethnic hostility is immense. Nevertheless the international policymaker must be realistic about what can and cannot be achieved through intervention. Ethnic hostilities, whether between Bosnian Muslims and Serbs, Russians and Ukrainians, or Sunni and Shi’a, once evoked become phenomenally hard to quell. In time the inter-ethnic violence they engender precipitates permanent political changes. Hand-wringing and ineffective western foreign policy instruments, such as sanctions and diplomatic isolation, matter little when weighed against the strategic goals mandated by the Realpolitik of the countries with real interests in the dispute. This, at its heart, is the most compelling argument against western humanitarian intervention. Humanitarianism is a laudable motive, but no substitute for raw strategic interests. Absent genuine geopolitical interest in another country’s conflicts, the West should stay out of others’ civil wars lest it risks exacerbating them and contributing to chaos through elicitation of false hopes. This may be the most important lesson from the Balkan wars of the 1990s for the ethnic conflicts and civil wars infecting the world in 2014. Who’s the hypocrite? South China Sea ed. While all eyes are turned to Ukraine and Nigeria, China’s disputes with its neighbors continue to fester. The latest is the ramming of Vietnamese vessels by Chinese vessels in the South China sea. China claims a big chunk of that body of water–meaning the unoccupied islands on it and the minerals underneath it. The U.S. argues, very plausibly (see map above), that China’s claim violates the UN Convention on the Law of the Sea, which limits coastal countries to undersea minerals only a few hundreds of miles out rather than the vast distances that China claims. So do China’s neighbors–Vietnam, the Philippines, Malaysia. But the funny thing about the U.S. argument is that the United States itself never ratified UNCLOS, instead declaring some parts of it that it liked “customary international law,” not the rest. So who’s the hypocrite? No one. Not China, not the U.S. The villain is UNCLOS itself, which attempts to settle all the world’s maritime disputes in a single multilateral document. (Well, almost all; it punts a few of them.) The problem is that territorial and maritime disputes in different parts of the world are not susceptible to simple principles like equidistance lines and uniform territorial seas and economic zones. They are all local and contextual. And unlike domestic legislation, there is no practical way to amend and update it; it’s frozen in stone. The U.S. probably should ratify UNCLOS but little pieces of the treaty bother important constituencies and so the executive branch has reasonably announced its acceptance of the rules that are not controversial. China should probably not have ratified the treaty, which lays down rules inconsistent with its claims–the treaty not surprisingly favors countries with huge coasts like the U.S. unless, as in China’s cases, other landmasses lie a short distance away–but back in the 1990s it was intent on being a good citizen while it was accumulating power. Now the government has little choice but to selectively violate terms it can’t live with. Here’s more on the topic. That is the (partial) title of a piece I wrote for Foreign Policy. Every so often I make this argument; it works better when the world seems to be crumbling around us. If the center holds, consider it a prediction. May be lurking behind a pay- or registration-wall. The argument is that in the 1990s, it appeared that there was emerging a “new world order” characterized by (1) international tribunals (along with the Security Council), (2) human rights, (3) international criminal justice, and (4) free trade and foreign investment protection. This was a liberal order, which led to the question why non-liberal countries would comply with it. In the legal academy, all answers were suggested (“networks,” “internalization,” “naming and shaming” by NGOs, “fairness,” and so on) except the obvious one, which is U.S. power. Countries acquiesced in an order because they feared the consequences of dissent. Now that U.S. power is declining, all the pillars of the new order except trade are collapsing. Odd, too, how in retrospect all those scholars, acting entirely independently and in good faith, seem like the U.S. government’s in-house ideologists.